New Horizons spied fainter Charon aside brighter Pluto in early July using our Long Range Reconnaissance Imager called LORRI. New Horizons has just completed a summer of intensive activities and entered hibernation on Aug. 20. The routine parts of the activities included thorough checkouts of all our backup systems (result: they work fine!) and of all our scientific instruments (they work fine too!). We also updated our onboard fault protection (a.k.a. “autonomy”) software, collected interplanetary cruise science data, and tracked the spacecraft for hundreds of hours to improve our trajectory knowledge. Added to this mix of routine summer wake-up activities for New Horizons were two major activities that had never been performed before. The first of these, conducted in early July, was planned imaging of Pluto and its largest satellite, Charon. As you can see from the image and caption above, we accomplished this using our LORRI long-focal length camera. Seeing these images, revealing our target as a true planetary binary, viscerally signaled to me that we’re nearing our destination and the end of the long, 3-billion-plus mile cruise we set out on back in January 2006. The other unique activity was a complete flight rehearsal of the final week of flyby activities on approach to Pluto, along with the first data transmissions that will follow. This dry run, in which the actual flight sequence for closest encounter was loaded aboard New Horizons and executed exactly as it will be in July 2015, was a major test — and it succeeded brilliantly! We’d planned this test for more than six years and rehearsed it on our ground simulators dozens of times to work out the details and shake out the bugs. We’d even run a 22-hour segment of it on New Horizons in the summer of 2012 as a mini-test. 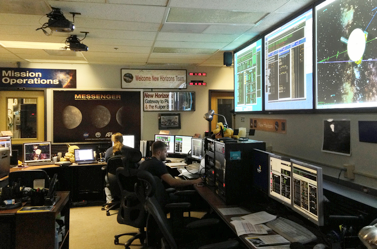 Flight controllers in the New Horizons Mission Operations Center at the Johns Hopkins Applied Physics Laboratory in Laurel, Maryland, keep an eye on the spacecraft’s vitals near the end of the Pluto-encounter rehearsal on July 14. But actually executing the whole shebang this summer was our biggest effort yet, and New Horizons performed outstandingly! Although the final, excruciatingly detailed engineering reviews of the rehearsal won’t come until early September, the clear success revealed in quick-look data analysis proved to us that the close encounter sequence and spacecraft will perform as designed. And it also yielded a bonus — the measured fuel usage of the close encounter sequence was a little lower than our predictions, showing we’ll have a bit of bonus fuel in the tank after Pluto for the exploration of Kuiper Belt Objects. The successful completion of this major milestone was, like the first image of Charon beside Pluto, a turning point that further signaled to us on the project that the end of our long cruise is nearing, and that the beginning of the actual encounter we built New Horizons for is palpably close. After all, encounter operations begin in just over 16 months, in January 2015! And if these activities weren’t enough to signal a fast-approaching encounter, a third event in July put the icing on that cake. That event, two years in the making, was a scientific conference sponsored by the New Horizons project to review everything known about Pluto and its satellites, their origin and evolution, and to hear informed scientific predictions about what New Horizons will find. More than 170 scientists registered for the five-day conference, which was held at the Johns Hopkins Applied Physics Laboratory in Laurel, Maryland, where New Horizons was built and from which it is now operated. The conference, “The Pluto System on the Eve of Exploration by New Horizons: Perspectives and Predictions,” was covered by science press who attended and wrote and tweeted about it; it was extensively blogged by New Horizons Deputy Project Scientist Kimberly Ennico; and will result in a special issue of Icarus, the premier research journal of planetary science. Hubble Space Telescope evidence that Pluto’s smaller moons vary wildly in brightness on irregular schedules, indicating these tiny worlds orbiting Pluto may be tumbling chaotically. Telescopic stellar occultation evidence that Pluto’s atmosphere is still thickening, and won’t collapse before New Horizons arrives. New predictions that Pluto could sport an interior ocean of water and active surface geology, possibly including geysers or volcanoes. A prediction that Charon may, from time to time, have a transient atmosphere created by the importation of fresh volatiles by comet impacts from the Kuiper Belt. And predictions that Pluto’s atmosphere may contain low-altitude clouds or even ground fogs, which excited some atmospheric physicists there but worried some geologists who equate clouds and fogs with curtains hiding the surface from view. And, oh yes, one more “finding” that I’m pleased to report (as many at the conference also noted): Throughout the proceedings, scientists of all stripes, including some who don’t regard dwarf planets as planets, repeatedly referred to both Pluto and Charon (though never their small moons) as “planets.” I wasn’t very surprised by this, since I hear it a lot at other conferences too, until one colleague asked me, “Why do you think [names withheld] referred to Pluto and Charon as planets when they didn’t sign the petition rejecting the IAU’s planet definition that excludes dwarf planets?” I was surprised by her answer to her own question: “I think it’s because they subconsciously think of Pluto and Charon as planets, and they can't help but say it in when referring to them.” I just smiled, filing that as a note to relay to you here. 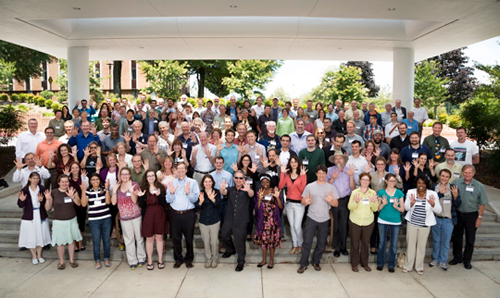 Participants at the Pluto system science conference gather for a group photo. How many fingers are they holding up? Before I close, I want to give a nod to efforts by New Horizons science team co-investigator Rick Binzel of MIT to create a Lego model of our spacecraft for kids and adults to buy, just as they buy Lego models of Mars rovers and other popular spacecraft. If you’re interested in helping, check the caption below the image of the New Horizons Lego design that Rick’s team put together. Anyone want a Lego model of New Horizons? For the Lego Group to build one, the model must first receive 10,000 supporting votes. Visit the website to support the effort. As I close this PI Perspective, I want to give you a quick overview of top-level flight-plan events planned between now and the start of encounter in January 2015. First, we’ll have the spacecraft in hibernation almost continuously until June 2014. That hibernation will be interrupted by a short, two-week wakeup in January 2014 for antenna repointing, new command loads and a few routine spacecraft-maintenance activities. 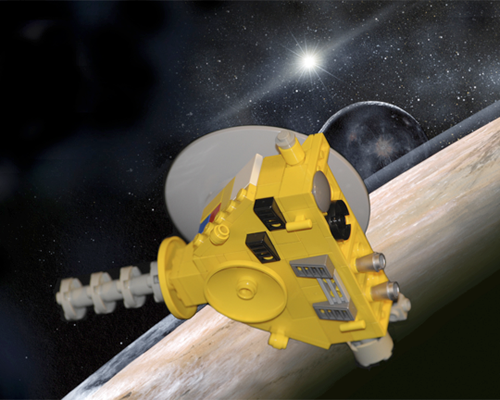 Starting in June we’ll wake New Horizons for two months, starting with optical navigation (“homing”) activities using the LOng-Range Reconnaissance Imager (or LORRI) to refine our course to Pluto. Next summer, we’re likely to also conduct a small course correction using onboard rocket engines to trim up our approach trajectory and closest-approach timing. And we’ll conduct another complete checkout of the backup systems and science instruments aboard New Horizons. Then, on the heels of encounter operations, we plan to conduct a few critical tests of long-range approach observations, some contingency procedures that could be called into play during the encounter, and a few pre-encounter instrument calibrations that can’t wait for the bigger calibration campaign we plan to conduct after the flyby in the fall of 2015. Following next summer’s activities, we plan to put New Horizons back into hibernation for one last cycle, beginning approximately Sept. 1, 2014, and stretching through late November or early December. Then we’ll wake the spacecraft up for encounter, just a few weeks before show time begins with the first distant encounter command load on Jan. 12, 2015. We’ll go at a fast pace from here to there, with the flight operations I’ve just outlined interwoven with distant encounter planning, contingency planning, and engineering peer reviews of every aspect of our flyby. A metaphorical image for our journey’s bridging of the Earth with another shore, shrouded in mystery, called Pluto, and the gate we’re crossing in January 2015 to begin the first exploration of a new planet since Voyager 2 reconnoitered Neptune in 1989. I’ll close by saying thanks again for following our journey across the deep ocean of space, to a new planet, and a truly new frontier. 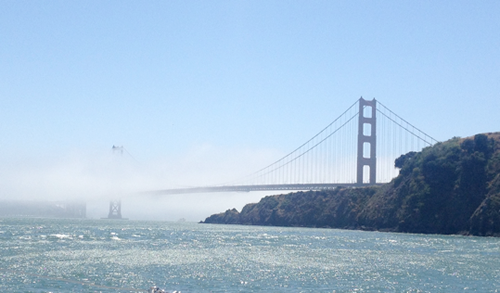 Until I write again (later this fall), I hope you’ll keep on exploring — just as we do!